Pennsylvania offers many great weekend getaway options for couples and families, from Hershey for chocolate lovers and romantic water views in Erie to scenic hiking in the Pocono Mountains, family water parks and vibrant cities like Philadelphia, Pittsburgh, Gettysburg and Harrisburg - popular Pennsylvania destinations that offer a choice of museums, restaurants and spas. Here are the best family and romantic weekend getaways in PA.
A modern sanctuary in the woodlands of Northeast Pennsylvania, the Lodge at Woodloch offers five star service, a luxurious spa, elegant guest rooms and delicious farm-to-table cuisine. One of the best romantic getaways in PA, the lodge has 57 rooms and suites with marble bathrooms, private verandas and a view of the gardens, the lake or the rock garden waterfall. Poconos Spa has 27 treatment rooms and offers a diverse menu of massages, body treatments, facials and salon services. Aqua Garden has an indoor and an outdoor pool, as well as co-ed soaking pools. TREE Restaurant and Bar serves healthy spa cuisine which incorporates naturally-raised meats and locally sourced ingredients, including vegetables and herbs grown in the three gardens at the lodge. If you are looking for places to visit in PA with great outdoor activities, the 15-acre private lake offers kayaking, fly fishing and other water sports. Read more. Explore Amish Country and get to know Pennsylvania’s Dutch heritage while staying at the Inn at Leola Village. The property has beautiful gardens, a pool, spa, two restaurants and a choice of accommodations. 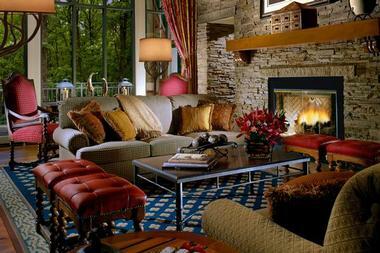 Couples can request a romantic suite with a fireplace or a cozy cottage on their weekend trip. Destinations Spa offers a full menu of treatments, including couples massages, facials and body treatments. In the evening, have dinner at TE, a formal Italian restaurant, or head to the more casual Osteria Avanti. Nearby, you will find many Amish farms, shops and markets where you can sample delicious cheese, visit a bakery and shop for handcrafted furniture, toys and other items. Weekend rates start at $150 per night. You can often save by booking a two-night package, starting at $270 on weekends. Details & photos. 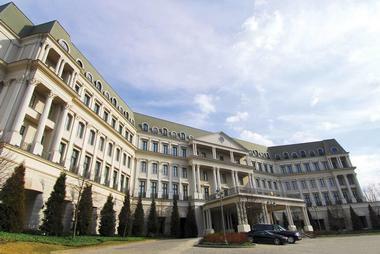 Located in the Laurel Highlands of Pennsylvania, Nemacolin Woodlands Resort is a five star getaway with great facilities, gourmet dining and on-site shopping. Accommodation options include suites, townhomes and luxury homes. Resort facilities include a spa, Shooting Academy, Adventure Center, and the multimillion dollar Hardy Family Art Collection. Nearby attractions include historical landmarks, nature trails, museums and wineries. A perfect combination of romance and relaxation, Cove Haven is a scenic couples-only hideaway on Lake Wallenpaupack. With luxury suites, a string of entertainment options and adrenaline-pumping activities, the hotel is a fun weekend destination. Guest suites are furnished with round king-sized beds, log-burning fireplaces, dry saunas, indoor pools and Bose entertainment systems. With contemporary décor and warm color schemes, suites offer a romantic, welcoming ambiance. Start the day with an aromatherapy wrap or a full-body massage at the spa. If you prefer outdoor action, you can have fun on the water and on land with speed boating, waterskiing, horseback riding, picturesque nature trails, miniature golf and much more. 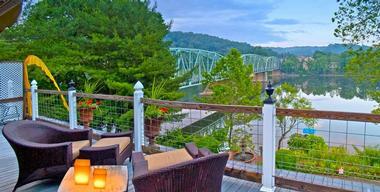 Cove Haven is one of the best romantic getaways in PA. The hotel offers plenty of in-house dining and entertainment with the trendy Colosseum Restaurant, TanLines Bar & Grille and the Champagne Palace Nightclub. Cove Haven is one of the top couples resorts in PA with rooms starting at $206 per night. Located in the heart of Cumberland Valley, Omni Bedford Springs is the epitome of relaxation and rejuvenation. The hotel offers elegant accommodations furnished with contemporary amenities and historic touches. Spacious suites have 9-foot ceilings, breathtaking views, deluxe beds and private patios. The spa offers natural treatments, pools and a well-equipped fitness center. The hotel has a diverse selection of restaurant and bars. Guests enjoy shopping and sightseeing in Downtown Bedford, fishing in the Gold Meal trout stream, and many other activities. If you are looking for unique romantic hotels in PA, this is a great place to visit. Stay on a 32-acre farm near Hersheypark and spend your weekend exploring Amish Country and Civil War sites. The Inn at Westwynd Farm has 10 guest rooms, many with fireplaces, two-person Jacuzzis and plenty of natural light streaming through large windows. Lancaster Arts Hotel is a charming hotel in Lancaster, Pennsylvania's historic downtown district, housed within the former A.S. Rosenbaum Tobacco Warehouse facility, which was constructed in the 1880s and operated as a tobacco storage facility until 1945. The Historic Hotels of America-affiliated hotel offers 63 elegant guest rooms and suites for overnight stay, blending historic design elements with elite modern amenities such as high-definition televisions, iPod docking stations, and a hotel-wide collection of regional art valued at over $300,000. Onsite dining is offered at the upscale John J. Jeffries restaurant, named in honor of a 19th-century tobacco inspector. Other amenities include onsite fitness center facilities for guest use. Surrounded by acres of natural splendor, Ledges Hotel provides a tranquil escape from bustling city life. Built in 1890 for John S. O’Connor’s glass factory, the federal-style building is a historic landmark. Hotel guest rooms are a perfect blend of country charm and modern convenience. With furnishings from the original Silk Mill, panoramic views and fireplaces, suites provide a peaceful ambiance to recharge your batteries. 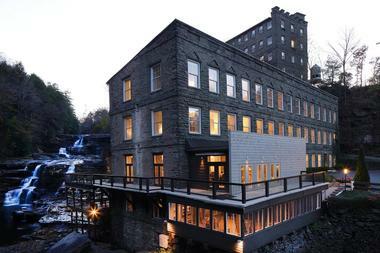 Enjoy fine dining overlooking the falls at the restaurant which is open for breakfast, lunch and dinner. Head to Lake Wallenpaupack for fun water activities like water skiing, speed boating and fishing. Gateway Lodge is a green retreat in Cook Forest which offers cabins and Aveda spa treatments. This eco-friendly lodge takes tranquility and comfort to a new level. Guest rooms at the Gateway blend beautifully with the natural surroundings with wooden décor and inviting fireplaces. Visitors can unwind on private balconies with views of the forest. Rooms have king-sized beds and plush sofas. The Woods Spa is an Aveda destination spa which utilizes natural ingredients. Gourmet meals are served at the romantic restaurant which offers a diverse selection of wine. For some outdoor fun, head to Clarion River for a day of fishing, kayaking and horseback riding. If you are looking for romantic cabin getaways in PA, this is a great inexpensive option for couples celebrating an anniversary, quick honeymoon or an engagement. Move into a castle for a day at the Buhl Mansion Guesthouse & Spa, a romantic getaway which looks like a castle. Take the Grand Oak staircase to your room, decorated with Old European-style furnishings, down comforters and in-room Jacuzzis.Indulge in a relaxing massage before heading out to dinner at the spa which has a steam room, sauna and monsoon showers. The nearby Donna’s Diner is a 50s-styled eatery offering mouth-watering local cuisine. If you have a sweet tooth, Daffin’s Candy is filled with delicious treats. Rooms start at $350 per night. 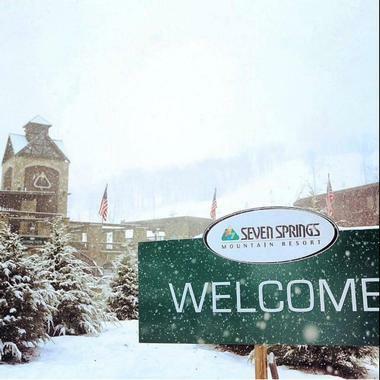 Seven Springs Mountain Resort offers travelers access to skiing, snowboarding and other mountain activities. 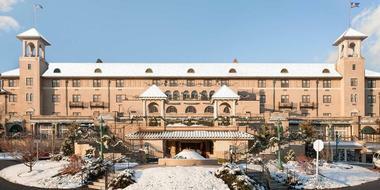 The resort offers diverse accommodations, including suites, cottages, condos, townhouses, chalets and pet-friendly rooms. Guests can dine at 11 restaurants, work out at the fitness center and relax at Trillium Spa. The destination offers fun activities for all ages. You can ski down the slopes, try your skills on terrain parks, have fun indoors in the Game Room, visit the bowling alley, or play miniature golf. Area attractions include the Flight 93 National Memorial and Frank Lloyd Wright’s Fallingwater. 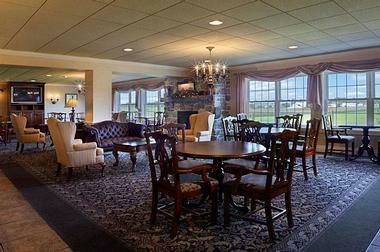 Located in Lancaster, Pennsylvania, Amish View Inn & Suites offers friendly service, rooms with a view and a restaurant. Ask for a suite with a fireplace and a full kitchen if you want to prepare your own lunch. The property has a fitness center, whirlpool and an arcade for kids. Plain & Fancy Farm Restaurant is a family-style dining room serving burgers and signature salads. Nearby activities include shopping in Lancaster City and plays at the Allenberry Playhouse. 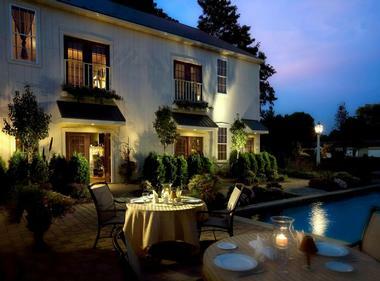 The Bridgeton House is a Bucks County getaway with romantic Delaware River views. Guest rooms feature unique, detailed furnishings that create an inviting, warm ambiance. Professional chefs serve a hot breakfast menu, snacks, beverages and dinners. You can enjoy meals on the river, on the dock, or take a Sunset Cocktail Cruise. Venture out into Bucks Country and take a walk through Solebury Orchards or follow the trail around Lake Nockamixon. Rooms start at $279 per night. Once the home of US Army General Bruce Kendall, Annville Inn Bed & Breakfast is now a 7,000-acre sanctuary in the captivating Lebanon Valley. A visual spectacle of natural beauty, the inn is surrounded by majestic mountains and lush farmlands – the perfect location for a country getaway. 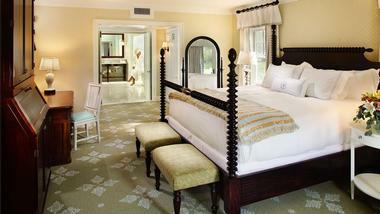 At first glance, guest rooms were designed with traditional elegance in mind. 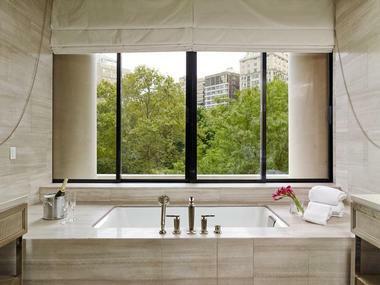 But a closer look reveals modern accents and contemporary artwork complemented by gorgeous views and in-room Jacuzzis. Watch movies in HD at the resident movie theater, spend a quiet moment in the tranquil garden room and enjoy a game of billiards with friends in the game room. The inn has a spa and a restaurant. Rooms start at $139 per night. Foggy Mountain Lodge in Stahlstown offers rustic accommodations with wood-burning fireplaces, kitchenettes, private patios and mountain views. There are three lodges on the property: Cedar, Pine and Chestnut. 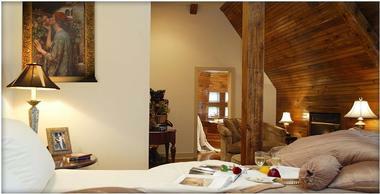 The suites are located in the Chestnut Lodge, offering from two to four bedrooms. 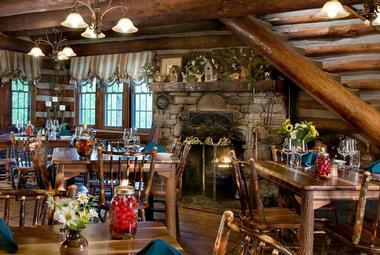 Foggy Mountain Restaurant serves a menu of steaks, sandwiches, pasta and chicken dishes. Rooms start at $75 per night. Milton Hershey built the iconic Hotel Hershey in the 1930s to overlook his chocolate factory. Guest accommodations include 276 guest rooms, luxury suites and cottages. The hotel is home to a spa offering chocolate-themed treatments. There are several dining options, including the Circular which serves American cuisine. For a taste of Italian, book a table at Trevi 5 or sample unique beverages at Cocoa Beanery. Numerous popular attractions are within walking distance of the hotel. Whether you want to watch a play at Bloomsburg Theatre, go sightseeing with the Millersburg Ferry Boat Association or experience exciting rides at the Knoebels Amusement Park, the local area has something fun for everyone. Rooms start at $279 per night. Lancaster is an ideal getaway destination in Lancaster County Pennsylvania, offering visitors of all ages various types of entertainment. You can get an informative glimpse of Amish and Mennonite lifestyle and culture by going on a tour of the Amish House and Farm and on a visit to the Mennonite Information Center. To learn about the fascinating history of Lancaster County you can tour the Historic Rock Ford Plantation or Wheatland, the country home of President James Buchanan. Art and theater enthusiasts can start by visiting the Philips Museum of Art, and the Demuth Museum, which showcases the work of Charles Demuth, a local American Modernist, and then attend a show at the historic Fulton Theatre, the American Music Theatre or the Dutch Apple Dinner Theatre. The Landis Valley Museum, a living historic village, and the North Museum of Nature and Science are educational fun for all ages. Family attractions include the Lancaster Science Factory and the Hands-On House Children's Museum of Lancaster, the Lancaster Marionette Theatre, Dutch Wonderland, where all ages can have hours of fun on over 30 rides, and the Caribbean Indoor Water Park. Foodies should not miss Central Market, the oldest Farmer's Market in the United States, where you can sample local specialties. To work off the calories, you can go hiking on over 30 miles of trails at Holtwood Dam. Situated just a short drive from Harrisburg, the capital of Pennsylvania, Hershey offers visitors a great selection of interesting activities to fill the weekend. Everyone knows that the name Hershey is synonymous with chocolate, and just about every attraction in the city owes its existence to the generosity of chocolate magnate Milton S. Hershey. You can learn everything you ever wanted to know about chocolate on a visit to Hershey's Chocolate World, where you can take an in-depth tour on the historic Chocolate Trolley, make your own chocolate bar and taste as much as you like. Visitors will learn about Milton Hershey's rise to fame at the Hershey Story interactive museum and the Founders Hall at the Milton Hershey School. For a change of pace, you can visit the Antique Automobile Club of America Museum and the Pennsylvania State Police Museum. For a breath of fresh air, you can head to Segway of Hershey for a Segway Tour or go for a walk through the 23-acre Hershey Gardens. The Gardens include the Historic Hershey Rose Garden, a Japanese garden and the Butterfly House and Children's Garden. Music lovers can listen to the Hershey Symphony Orchestra in action at the historic Hershey Theatre or attend an open-air concert at the Hershey Park Stadium, and families can have hours of theme-park fun at Hershey park, or visit the Zoo America North American Wildlife Park. Erie is the fourth-largest city in Pennsylvania and has a host of interesting activities to keep the whole family engaged and entertained. Get your bearings from the upper viewing deck of the Port Erie Bicentennial Tower, which offers expansive views of Lake Erie, Presque Isle Peninsula and downtown Erie. If you are interested in history you can visit the Erie Maritime Museum, the Firefighters Historical Museum or arrange a tour of some local historical buildings, presented by the Historical Society of Erie County. Culture vultures will enjoy the Erie Art Museum and the Erie Philharmonic Orchestra, and be spoiled for choice when it comes to the performing arts which can be enjoyed at All an Act Theatre Productions, the historic Warner Theatre or the Erie Playhouse. To embrace the great outdoors you can spend the day in the Presque Isle State Park, which offers hiking and cycling trails and a variety of water sports, including scuba diving, canoeing and scenic cruises in summer, and an extensive selection of snow sports in winter. You could also head to Ashbury Woods Nature Center for hiking, cycling, picnicking and fishing. Family attractions include the Erie Zoo and Botanical Gardens, the ExpERIEnce Children's Museum, the Waldemeer Park and Water World, where you can enjoy over 100 rides and slides, and Splash Lagoon, where you can swim in a huge wave pool. Treat your family to an active outdoor weekend adventure in the beautiful Poconos Mountains, which overlook the scenic Delaware River, offering a wide variety of activities all-year round. 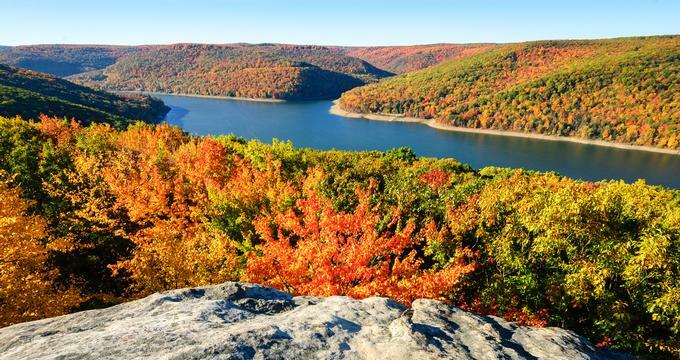 In summer you can choose to go wildlife-viewing and hiking along hundreds of miles of trails in the Delaware Water Gap Recreational Area, the Hickory Run State Park, the Francis Slocum State Park or the Promised Land State Park, which also offers boating and fishing on two lakes. At Bushkill Falls you can explore several trails and observation platforms overlooking the amazing waterfalls, and at Pocono TreeVentures you can go climbing or enjoy the thrilling ziplines. In winter you can head to one of several ski areas such as Jack Frost Mountain Resort, the Shawnee Mountain Ski Area or the Camelback Mountain Resort to enjoy all forms of snow sports. Equipment rental is available on-site. To learn about the history of the area you can tour the Quiet Valley Living Historic Farm or visit the No 9 Coal Mine Museum and the Eckley Miner's Village to travel deep into the mines and hear harrowing tales of the hardships faced by the pioneer miners. You can take the children to the Claws ‘N' Paws petting zoo and animal park or have hours of fun at the Great Wolf Lodge Water Park, Kalahari Waterpark or H2Oooohh Waterpark. Plan your next weekend break in Philadelphia, a city just bursting at the seams with interesting attractions and activities for the whole family. You can brush up on your knowledge of American history and see the famous Liberty Bell at the Independence National Historical Park on Chestnut Street. A guided tour of Independence Hall will show you the actual rooms where the United States Declaration of Independence and the United States Constitution were signed. There is plenty to delight art lovers in Philadelphia, starting with the Philadelphia Museum of Art, and the Rodin Museum, which features one of the largest public collection of Rodin sculptures outside of Paris. At the Barnes Foundation on Ben Franklin Parkway you can see a wonderful collection of ancient, modern and contemporary art and then round off your artsy day on a Mural Arts Program Tour. Try not to miss a visit to the Morris Arboretum of the University of Pennsylvania where you can stroll through acres of themed gardens and get a bird's eye view from the 50-foot high canopy walk. For children there is the Philadelphia Zoo, where you can see everything from lions to lizards, the wonderful interactive Please Touch Museum and the Smith Memorial Playground and Playhouse. Philadelphia has wonderful restaurants to delight foodies, and you can also visit the Reading Terminal Market and the 9th Street Italian Market. If you are looking for a getaway destination with good museums, great outdoor activities and an emphasis on the arts, Pittsburgh will not disappoint. The Carnegie Museum of Natural History will thrill all dinosaur enthusiasts, and the entire family can have hours of educational fun at the Carnegie Science Centre which includes an Omnimax Theater and the world's largest collection of robotics. To immerse yourself in the visual arts you can start with contemporary art at the Carnegie Museum of Art before moving on to the Andy Warhol Museum, the fascinating Mattress Factory, which features room-sized installations that you can really dive into, and the Frick Art and Historical Center, which boasts a fine art collection in a historical mansion. Music lovers can attend the Pittsburgh Symphony Orchestra at the Heinz Hall for the Performing Arts. A great way to see all the hidden gems of Pittsburg is to book one of the many tours arranged by Pittsburgh Tours and More, or experience a walking tour by Burgh Bits & Bites Food Tours. Pittsburgh has some great places to spend time outdoors including Schenley Park, where you can hike, cycle, attend an outdoor concert at the Phipps Conservatory or even play a round of golf at the Bob O'Connor Golf Course. Families can take the kids to the Pittsburgh Zoo and PPG Aquarium and the interactive Children's Museum of Pittsburg. Gettysburg is a place steeped in military history, where you can spend a weekend walking in the footsteps of the brave men who lost their lives during the Battle of Gettysburg. The Gettysburg Museum and Visitors Centre in the Gettysburg National Military Park provides an excellent overview of what you will be seeing, and there are guided tours led by the Association of Licensed Battlefield Guides who will bring the epic battle to life for you. Ardent historians can visit Eisenhower National Historical Site, the Gettysburg Museum of History, and the Shriver House Museum and Jenny Wade House, both of which paint a chilling picture of the lives of everyday people during the Battle of Gettysburg. At the Gettysburg Seminary Ridge Museum you can explore interesting interactive programs relating to the famous battle, and at the Gettysburg Diorama you can see an amazing display which recreates the battle in miniature. For a break from the military history of the city you can visit the Lincoln Train Museum and the Gettysburg Railroad Station Museum. All that walking can get a bit tiring, but there are other ways to explore the main historic sites including Segway Tours of Gettysburg, Cornerstone Farm Horseback Tours or by bus on the open-top Gettysburg Battlefield Bus Tour. Harrisburg, the capital of Pennsylvania, is located along the banks of the scenic Susquehanna River and provides weekend visitors with a good selection of attractions suitable for all ages. One of the most imposing historical buildings you can tour is the Pennsylvania State Capitol, which was designed in the beaux-arts style in 1902 and features many beautiful murals, sculptures and stained-glass windows. If you love historic buildings you can also visit the Fort Hunter Mansion and Park and the John Harris-Simon Cameron Mansion which dates back to 1766. One of the top family attractions is the Whitaker Center for Science and Arts, which features the Harsco Science Center, the Select Medical Digital Cinema and the Sunoco Performance Theater. Other interesting museums you can visit include the Pennsylvania National Fire Museum, featuring vintage hand-drawn fire-fighting equipment, the State Museum of Pennsylvania, where you can explore the history of the area and see a show at the planetarium, and the National Civil War Museum, where you can learn all there is to know about the Civil War. Cultural attractions include the Susquehanna Art Museum and the Harrisburg Symphony Orchestra. Outdoor enthusiasts should head to Wildwood Park, a wildlife sanctuary which you can explore on various trails and boardwalks, and to the BenjaminOlewine III Nature Center where you can observe water birds from the glass bird blind. Treat yourself to a weekend getaway in the historic mining town of Jim Thorpe, nestled in the heart of the scenic Pocono Mountains. Enjoy strolling down the main road where just about every building has a history and every corner boasts a unique little shop, inn or restaurant. One of the most outstanding historic buildings you can tour is the Asa Packer Mansion Museum which was built in 1861 for railroad magnate Asa Packer, and has been perfectly preserved to showcase how the family lived back then. At the Old Jail Museum you can visit the cells and see the gallows where seven Irish miners were executed following the infamous Molly Maguire trials. You can tour the Mauch Chunk museum to learn all about coal mining in the area, get a taste of Jim Thorpe culture at the Mauch Chunk Opera House or go on a ghoulish summer ghost tour with Walk This Way Tours or Rotary Club Ghostwalks. The Lehigh Gorge Scenic Railway takes you on a 70-minute narrated journey through the Lehigh Gorge State Park, which is at its best in the fall. Pocono Whitewater and Jim Thorpe River Adventures both offer thrilling white-water rafting adventures, suitable for both families and more experienced adventurers. Additionally, both places rent canoes, kayaks and cycles. The Bear Mountain Butterfly Sanctuary is a perennial favorite for all ages. Situated just 1.5 hours from New York City, Milford is the perfect weekend getaway in the heart of the beautiful Pocono Mountains. Spare a few hours to explore the history of Milford by visiting the Grey Towers National Historical Site where the concept of nature conservation was born, and the Upper Mill which was built between 1804 and 1837, where you can learn about rural life 150 years ago. One of the primary attractions in Milford is the majestic Raymond skill Falls in the Delaware Water Gap National Recreational Area. The falls are comprised of three drops which are over 150 feet high. You can view them from two observation platforms and enjoy hiking through the extensive area to see wildlife and other lesser waterfalls. At Milford Beach & the McDade Recreational Trail, you can enjoy swimming and boating in the Delaware River and hiking, biking and bird watching. For a more active adventure you can hire tubes, rafts, canoes and kayaks from Killatinny River Trips and Ziplines, who also arrange zipline adventures. In summer you can make use of the Pocono Pony, a free bus transit between the Delaware Water Gap Recreational Area and Milford Beach. Milford hosts several annual events including the Milford Music Festival in June and the Black Bear Film Festival in October.